Thailand Amulets presents another compiled video slideshow of some of the many amazing amulets added in March and Early April 2018, to Thailand-Amulets.Net And to our sister store and afilliates at Ancient Amulet and Buddhist Amulet The video presents a host of amulets from all affiliated stores, with a plethora of different kinds of amulets ranging from ancient classics, to modern era popular amulets of present day masters, with powers ranging from from Maha Sanaeh, Metta Maha Niyom, Maha Lap, Maha Pokasap, Klaew Klaad, Kong Grapan Chadtri, Gae Aathan, Serm Duang, Serm Yos, Siang Choke, and Raksa Roke. 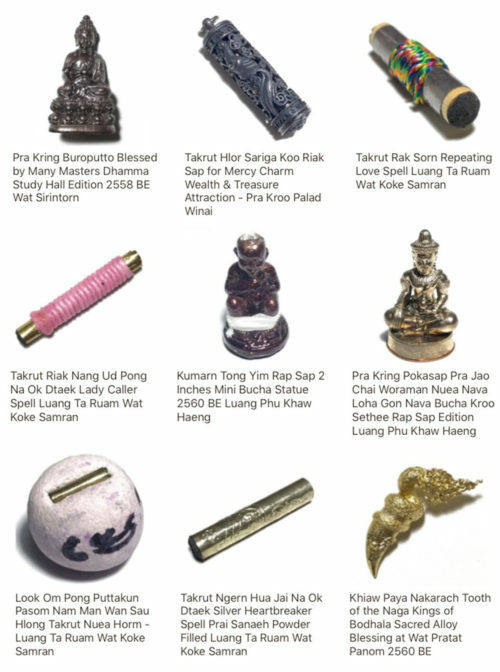 There are new amulets added for enchantment, seduction, good Karma, good business, promotion, protection against black magick and deadly dangers, gambling, love and passion..
Thai Amulets added to all of our affilliate stores in January 2018 are presented in this 11 minute long slideshow, which shows a selection of Thai Buddhist Amulets and Occult Charms which arrived in January. A host of new amulets were added to ancient amulet store, along with some very rare amulets being added to the Thailand Amulets store, along with a few new additions to Buddhist Amulet store. 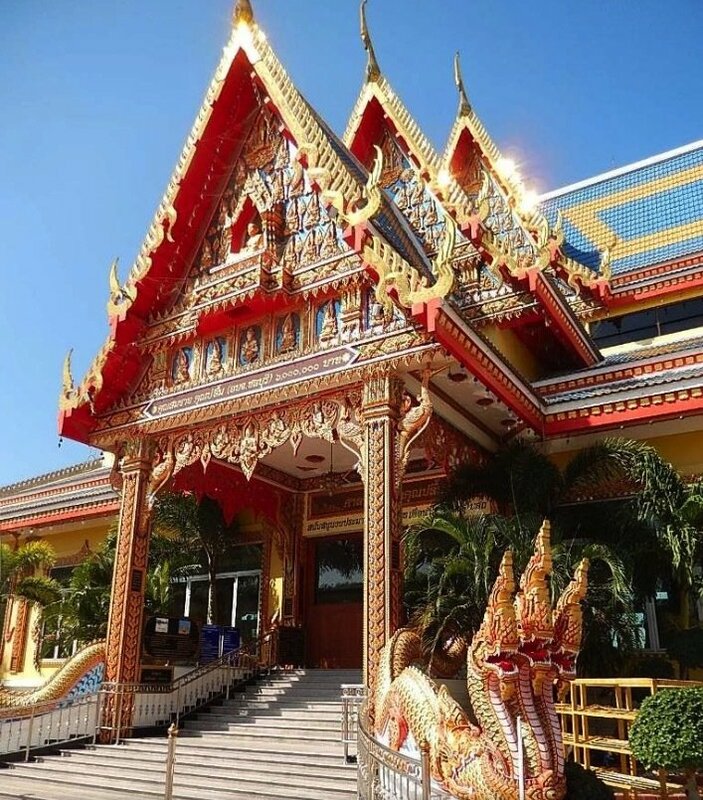 Pra Put Lek Lai Luang Por Huan Wat Putai Sawan, Giant size Lek Lai Jet See Rainbow Lek Lai Kaya Siddhi Adamantine Substance, Look Om Luang Phu Khui sacred Betel-Areca ball using the Wicha Look Om of Luang Por Tob of Wat Chang Phueak (Wat Chon Daen). Some Large Pieces of Lek Lai Kaya Siddhi Adamantine Substance, and a rare Bia Gae Cowrie Shell Animist Charm from Luang Phu Juea of Wat Klang Bang Gaew. 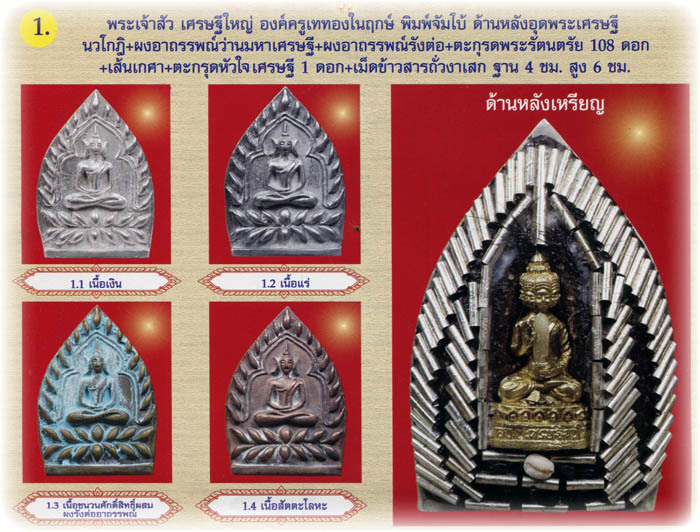 Also some amazing Talismanic Charms added were the famous Black Takrut Kong Grapan Chadtri Klaew Klaad and Red Takrut Metta, two immortally popular Takrut amulets of Luang Por Jamlong, of Wat Chedi Daeng. Luang Por Jamlong is a deceased Master whose Takrut became extremely popular due to the massive success by so many devotees. Two different and extremely rare Takrut Kart Aew Magic scrolls on cord belts for Kong Grapan Chadtri Klaew Klaad were added from two great deceased masters, Luang Por Koon and Luang Phu Hongs. From Luang Por Koon came the Chueak Takrut Koo Ud Look Sakot Nuea Dtakua, composed of Twin Yantra Scrolls with 6 Spellbound Seals. From Luang Phu Hongs came the Chueak Takrut Kart Aew 22 Dork – twenty-two Magic copper Yantra Foil Scrolls on Cord Belt, from the Early Era of Luang Phu Hongs. 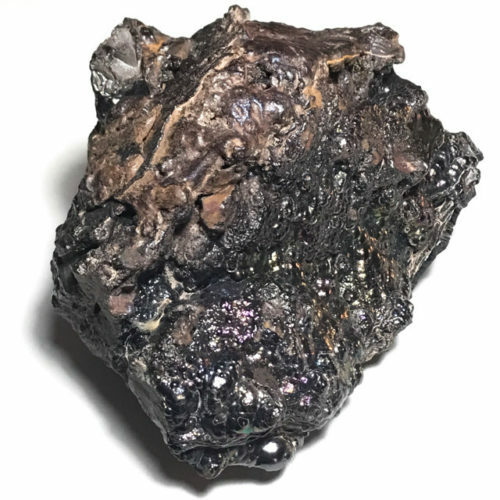 In addition, because people are finding it ever more difficult to browse through the many thousands of amulets in Thailand Amulets store, we have begun to post amulets from any Masters we have not brought to you yet, in a new Thai Amulets store at Thailand-Amulet.Com, so that the amulets are easier to access. We found that once a store reaches over 3500 amulets in store, it becomes difficult to browse, and so we decided to make it easier by splitting the amulets between each store, with each store having its own character and specialities. 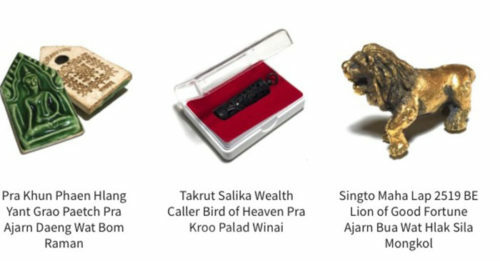 Takrut Tone Amulets of Luang Por An of Wat Prayatigaram, and Luang Phu Doon (Wat Buraparam), Kroo Ba Nanta (Wat Tung Man Dtai), Luang Por Mui (Wat Don Rai), and Luang Por Phaew (Wat Tanode Luang), as well as some Muan Sarn Sacred Powders Nuea Krang amulets of this Master of Wat Tanode Luang. 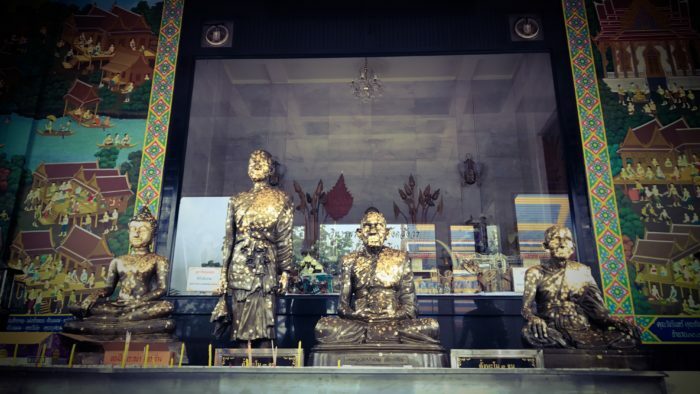 Various exhibits of the famous Pra Pid Ta amulet were added, including the Pra Pid Ta Mai Gae carved wooden Nirodha Buddha of Luang Phu Rod, the legendary pear shaped Pra Pid Ta of Luang Phu Rian, and the famous Pung Bpong amulet of the Great Luang Phu Sukh ( Wat Pak Klong Makham Tao) were also added. 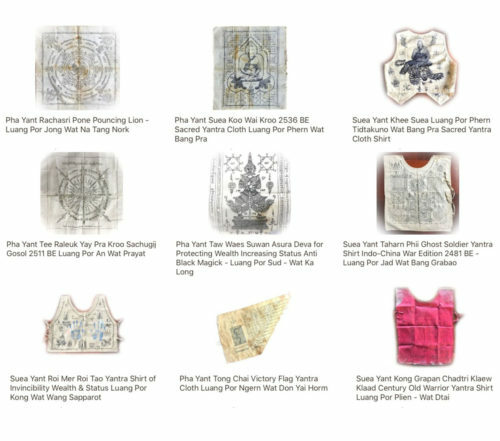 Some amazing Pha Yant cloths were added, as well as some amazing Suea Yant Sacred Yantra shirts of the ‘Taharn Phii’ (ghost soldiers), such as the Suea Yant Roi Mer Roi Tao of Luang Por Kong (Wat Wang Sapparos), and the Suea Yant Luang Por Phern Tidtakuno (Wat Bang Pra). 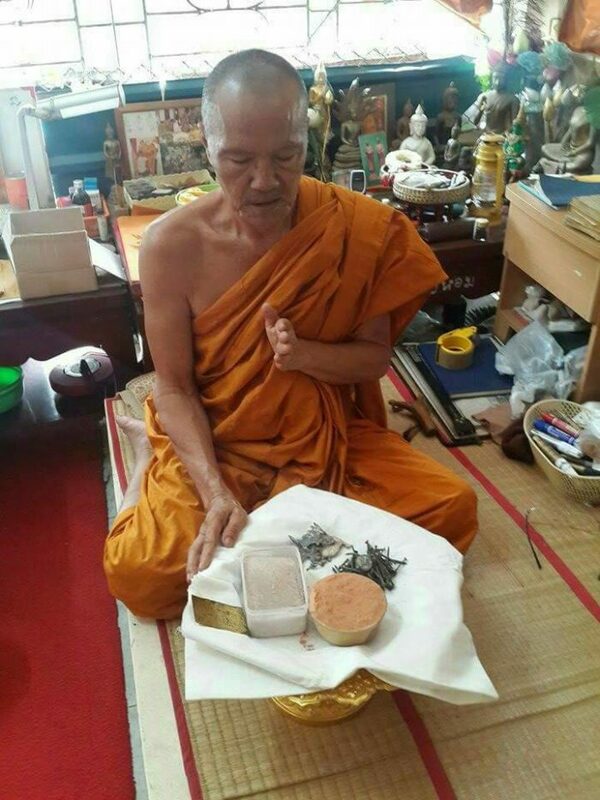 Look Om Sacred Powder Wishing Ball amulets from Luang Por Tong Sukh (Wat Tanode Luang), Luang Por Parn (Wat Bang Nom Kho), and Wishing Crystals of Luang Por Opasi (Asrom Bang Mot), Luang Por Pring (Wat Bang Bakork), and Luang Por Ruesi Ling Dam (Wat Ta Sung). 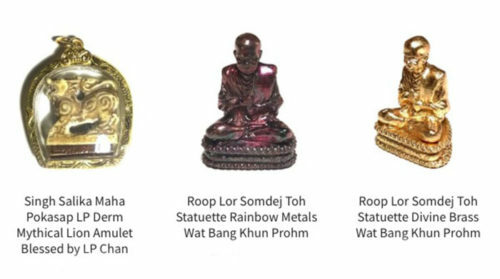 The legendary Chin Dtakua Fang Khiaw Hmaa Pha wolf tooth leaden Buddha amulets of the great and Elusive Khmer Sorceror-Monk Luang Por Dam, of Wat Kuti have also reappeared in store after three new exhibits were discovered by our scouts. 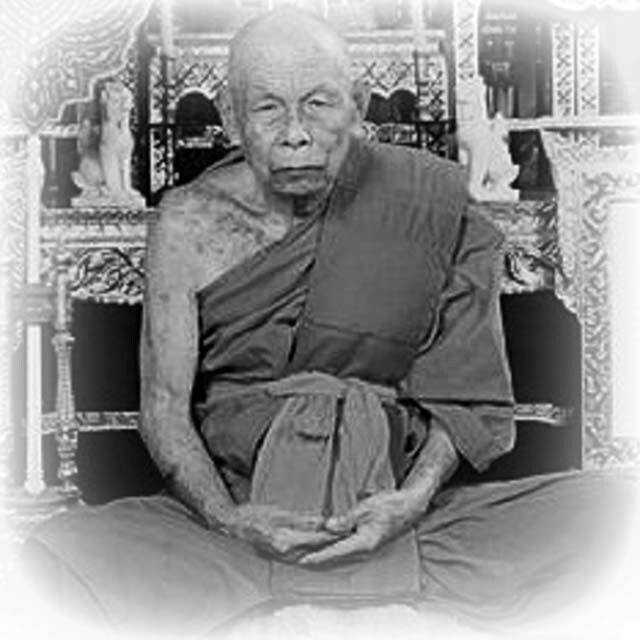 Pra Put Dtakua Fang Khiaw Hmaa Pha Luang Por Dam Wat Kuti. 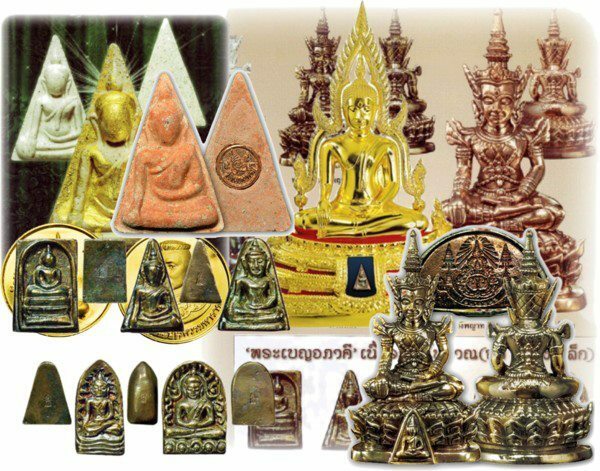 A selection of beautiful Buddhist Amulets and some Powerful Occult Charms were also added to our small store at Buddhist Amulet, which has a different character to Thailand-Amulets store, and defines itself with its own specific selection of Masters and Approved Temples. The new additions include Pra Kring, Takrut, Look Om, and Kumarn Tong amulets. 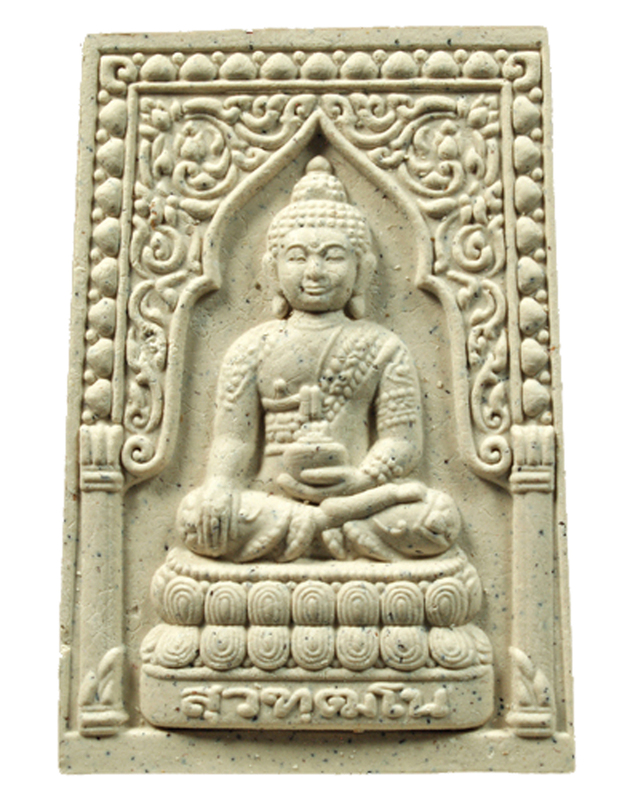 Presenting an easy to sit back, relax and watch slideshow of the amulets added to Thailand Amulets, Buddhist Amulet, and Ancient Amulet Stores in the Month of April. 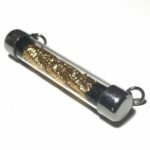 Please enjoy this long slideshow presenting you with a general overview of the latest amulets we have added to all three online amulet stores, without having to visit all three stores to browse. You can see which store which amulet was added to easily because each picture has the url of the store it was added to watermarked on it, as each image comes up throughout the slideshow. We hope you enjoy the slideshow. The Music for this slideshow was composed and played by Thailand-Amulets Proprietor, Ajarn Spencer Littlewood, Music Making being one of his personal hobbies, which he does to relax from his hard work authoring and publishing info on Buddha Magic, Sak Yant Thai Temple Tattoos, and Thai Amulets. 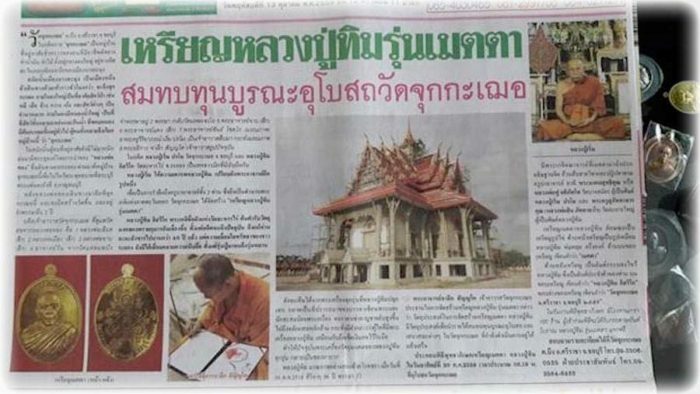 On the subject of Ajarn Spencer Littlewood and Tattoos, we can also update some news that Ajarn Spencer Littlewood has now opened a Modern Hygienic Tattoo Studio and Tattoo School in Pattaya district, and is installing his Sak Yant Foundation Museum of Sacred Yant, and is now planning to install a small area for Bucha to Por Gae Lersi Dta Fai and Sak Yant, for performing Sak Yant. 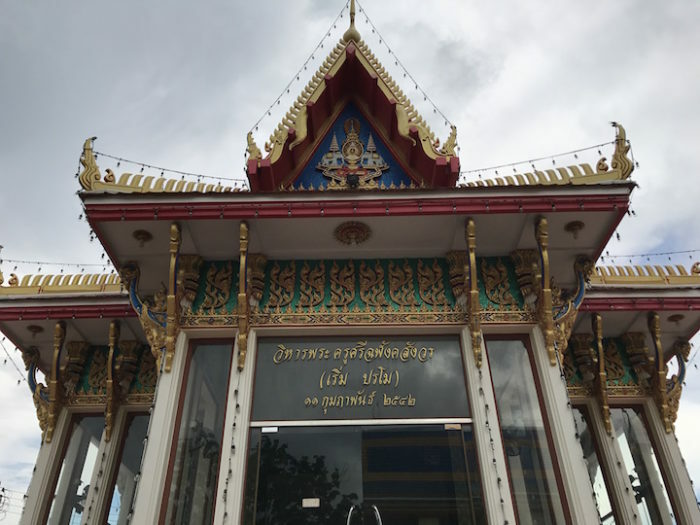 He will then be receiving people who wish to visit and receive information or just chat about the subject of Sak Yant Thai Temple Tattoos, Buddha Magic, the Lersi, and in certain circumstances, perhaps also receive a Sak Yant Tattoo. Ajarn Spencer uses Modern State of the Art Autoclave Sterilisation, and Ultrasonic Cleaning Instruments from the Modern tattoo Studio at Pattaya Tattoos, to ensure Safe Hygienic Traditional Sak Yant Tattooing (and modern tattooing), which can be applied by hand method or machine method, and ensures complete prevention ofd cross contamination, for Safe Health and Hygiene. Pattaya Tattoos Studio, Tattoos School and Samnak Sak Yant Featuring Ajarn Spencer Littlewood’s Sak Yant Foundation Museum – Modern Hygiene with Ancient Art. 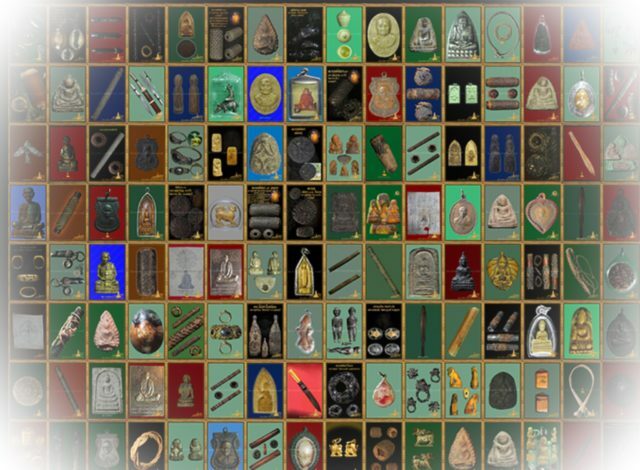 Thailand Amulets store, and all of its social pages, are now available as an Android app, for free download in the Google play store. An iTunes app is also in the making, and should be ready within about one week from now and will be submitted to the iTunes App Store for those who use iPad iPhone or Mac. You can download the android version of the ThailandAmulets app and store, by clicking on the following link. 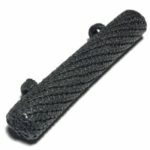 We now have various options for hanging your animists charms and amulets at waist level in the traditional type method using our new range of takrut belts. These belts are called ‘Chuak Takrut Kart Aew’, which are hand plaited cord belts for takrut, palad khik, and other occult charms such as tiger claws and wild boar tusks. One can thus hang them tied to the waist cord according the traditional Thai way of wearing these kind of amulets. 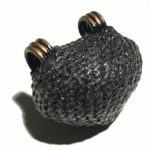 Depending on the type of the amulet, one can place the amulet on the front, left, right, or back of the Chuak Takrut Kart Aew, using metal rings to attach them with. 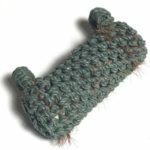 Also, as a closure method, a loop is attached to one end of the belt to feed the cord through and tie it. 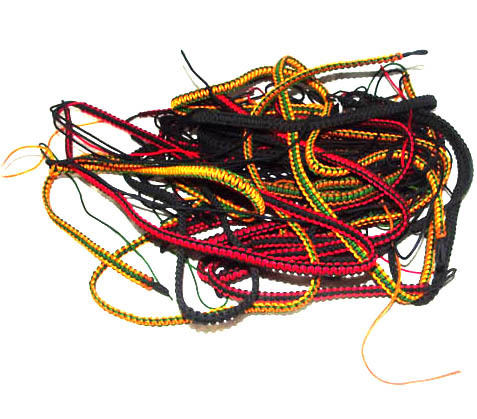 The waist cords are hand woven with multiple threads that will allow you to attach your amulets in such a way that there will be no chance of losing them. Moreover, the cord is extremely durable and it is even washable, making this waist belt a perfect choice for everyday wear. Due to the triple plaid weave, it is unlikely that it will break. Thus, the Chuak Takrut Kart Aew will last for a very long time indeed. The new belts have been added been added to the shop in various colors, namely black, red/black, and yellow/green. Two different sizes are available: 24–34 inch and 34–40 inch. 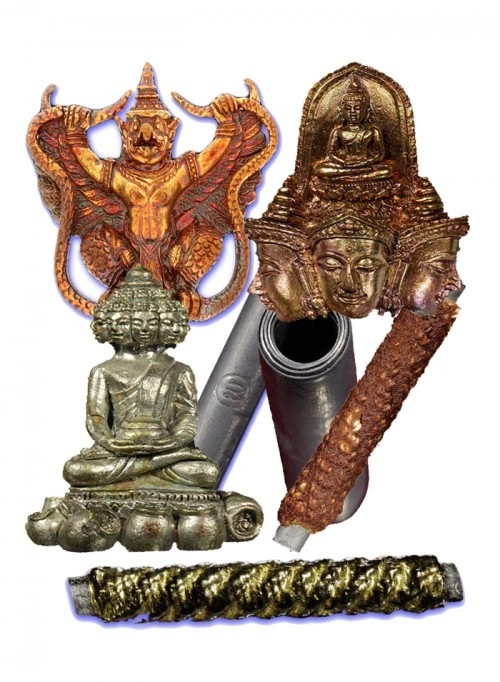 Thailand Amulets store also offers various other accessories and peripherals for your amulets, such as Buddhist rosaries, neck chains, cords, takrut casing, bracelets, rings, amulet cases, eyeglass, pliers, and pendant rings which can be viewed here: Accessories. « Sacred Magic Wands hand inscription of Khmer Spells cut from a Holy Tree. 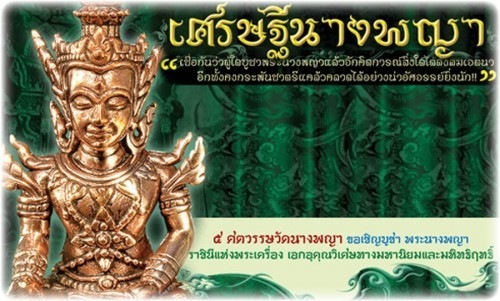 Thailand Amulets Newsletter for April takes a look at the latest amulets added during March, and April 2013, with some news of the arrival of the Long Awaited Jao Sua Sethee Yai‘s arrival, after a long delayed wait. 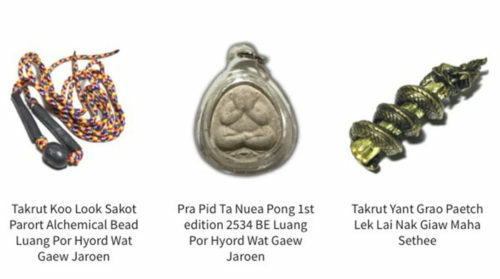 The new series of Master Class Amulets from Luang Por Jerd of Suan Badibat Tam Po Sethee in Nakorn Pathom is as impressive as the last edition of lockets, Taw Waes Suwan and Wua Tanu amulets, which also featured the amazing insertion of 108 Takrut, 56 Takrut, or 28 Takrut spells within a Muan Sarn base of Ya Wasana Jinda Manee paste. Above; Pra Jao Sua Sethee Yai – Nuea Pong Wan Pasom Ya Wasana Jinda Manee with 28 solid silver Takrut Pra Putta Jao (28 syllables of the heart mantra of the 28 Buddhas). Three different ‘Pim’ (models) were issued in Sacred Powders, featuring 28 Takrut Pra Putta Jao, 56 Takrut pra Puttakun, or 108 Takrut Pra Radtana Dtrai. All 3 models have a Takrut Hua Jai Sethee Yai Millionaire spell inserted. This edition from Luang Por Jerd follows this formula and presents us with the largest Jumbo size Jao Sua amulets we have ever seen. 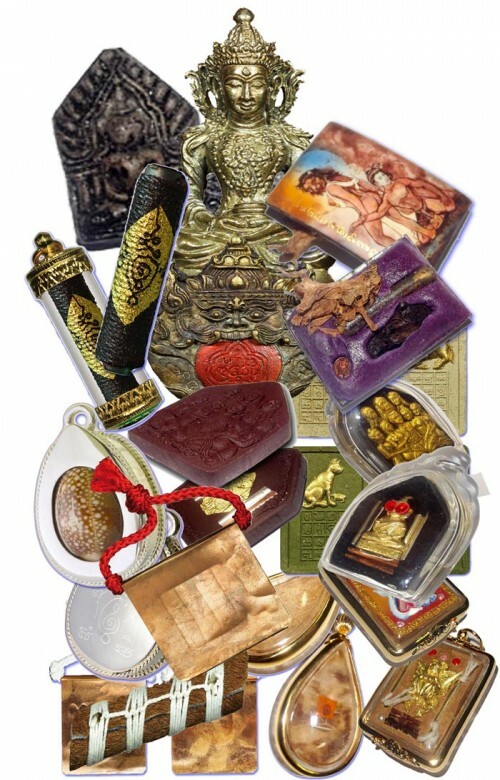 The ‘Rian Jao Sua Sethee Yai’ Ongk Kroo Jumbo Masterpiece amulets are made in a vast array of models in differing Sacred Metals Sacred Powders. The rear faces have a Pra Sethee Navagote Buddha as a Loi Ongk statuette holding a sacred rice grain inserted, and a mass of 108 Takrut inserted, along with other Sacred Muan Sarn ingredients. 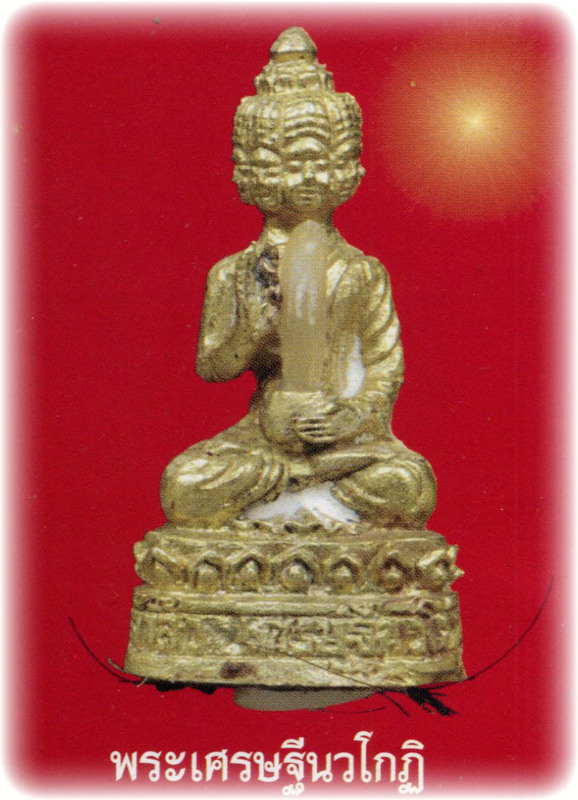 Above; The Pra Sethee Navagote – also released as a Loi Ongk Statuette Amulet in this same edition. There were also some standard size ‘Jao Sua Boran Baeb Mee Huang’ ancient style amulets made without Ya Wasana Jinda Manee filling on rear face, and inscribed Yantra on the metal rear face instead, without Takrut inserts. These versions were made with the olden days style metal hoop ring attached to them. The Jao Sua Sethee Yai Multimillionaire Edition is extra special in both its Sacred Powder versions and the Metallic versions, for their ingredients. 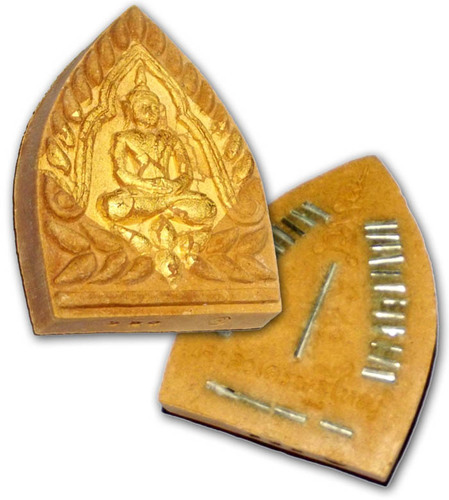 The Sacred Powder models are made from the finest Ya Wasana Jinda Manee Powders from the lineage of Luang Phu Bun, Perm, Juea, and Sanya (Kong) of Wat Klang Bang Gaew, the best and most powerful Ya Wasana Jinda Manee in existence. 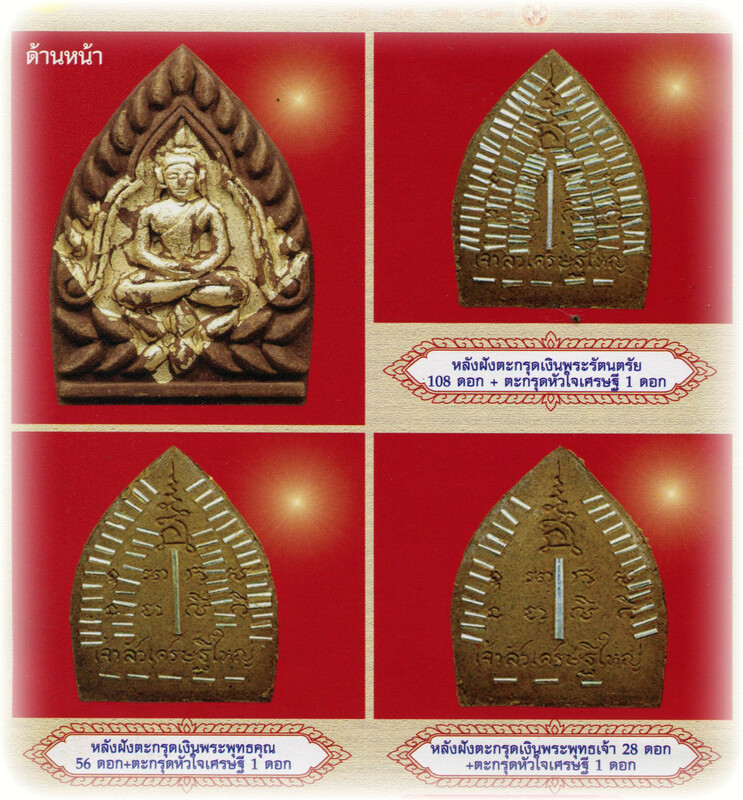 As for the Metallic versions, its Chanuan Muan Sarn content, for Luang Por Jerd has been keeping remnants of previous editions of Jao Sua amulets right back to the very first edition, and has used them in the making of the Sacred Alchemical Chanuan Muan Sarn Alloys to smelt the Jao Sua Amulets with. This is yet another Master Class series of amulets from Luang Por Jerd which we are proud to offer to our esteemed clients and friends. We recommend this series in the same way that we recommended the Serp Dtamnan Luang Por Noi edition from this Great Master. 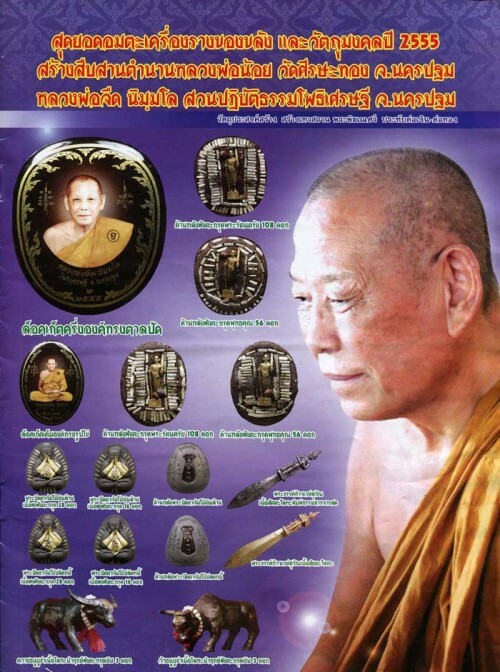 It can be seen that the Thai Amulet community and the Buddhist devoteee in Thailand is recognizing the merits of Luang Por Jerd ever more, and his amulets are now amongst the most highly collected and fast depleting of all modern Buddhist Guru Monk amulets. A great Master of diligent practice, quality made amulets, Sacred Chanuan Muan Sarn, and on the Ongk Kroo versions, Hand inscription during the ceremony by Luang Por Jerd, writing Khom Agkhara around the edges of the metal Jumbo Ongk Kroo Jao Sua Amulets. 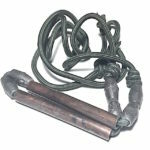 The standard size models had no Sacred Powder filling or Takrut but had Inscriptions on the rear face, and an olden says style pendant hoop attached as one piece. This edition is being written up and will be published in the coming days as we add all the amulets of this edition to the store. 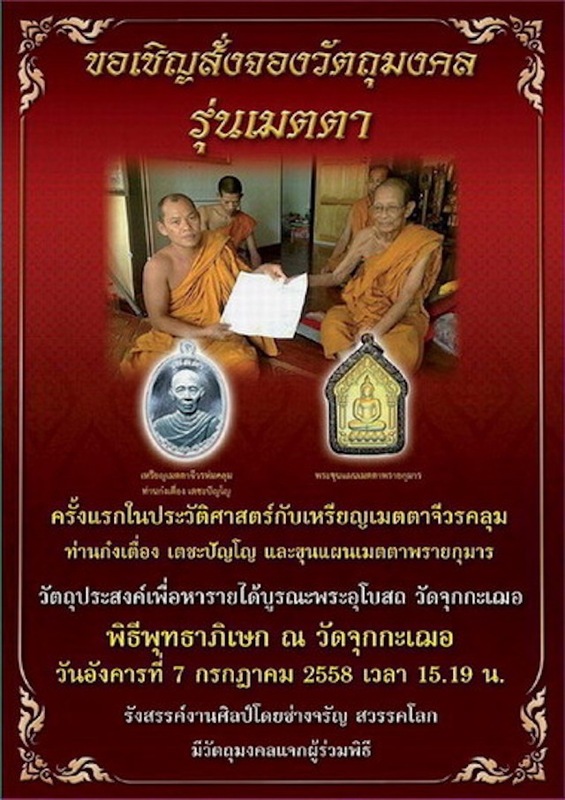 Also now arrived in store are the 125th Anniversary edition Luang Phu To remembrance memorial nostalgia amulets from Wat Tham Singto Tong, and are a most eminent and high quality series of Master Class amulets made by the direct Lineage Looksit of LP To and using the original Sacred Muan Sarn of his original Pid Ta Amulets. Another extremely recommended edition for its small number edition series coins and pid ta, and the extremely fine quality build, and empowerment faithful to original method. To complement this months new additions is the Pra Yord Tong 9 Blessings 2nd Edition Amulet series from the Temple of the Dawn, which was released in 2554 BE. The edition was called ‘Gao Maha Mongkol’, and is a classic edition which we were delighted to find some remaining examples of to provide and showcase to you in the store. Gao Mongkol’ means 9 Auspicious Blessings. In the The year 2554 the Temple of the Dawn released the Gao Maha Mongkol edition, with a long awaited continuation of the Dtamra Pra Somdej Kaiser. The Pra Somdej Kaiser is a Classic Somdej Amulet which has been famous ever since His Majesty King Rama 5 reputedly gave one to the Kaiser of Germany. The edition was spearheaded by this, the second ever issue of the Wat Arun Pra Yord Tong Loi Ongk Buddha Image statuettes, with a superb boxed 2-set of Pra Somdej amulets, as the official flying colors of the edition. 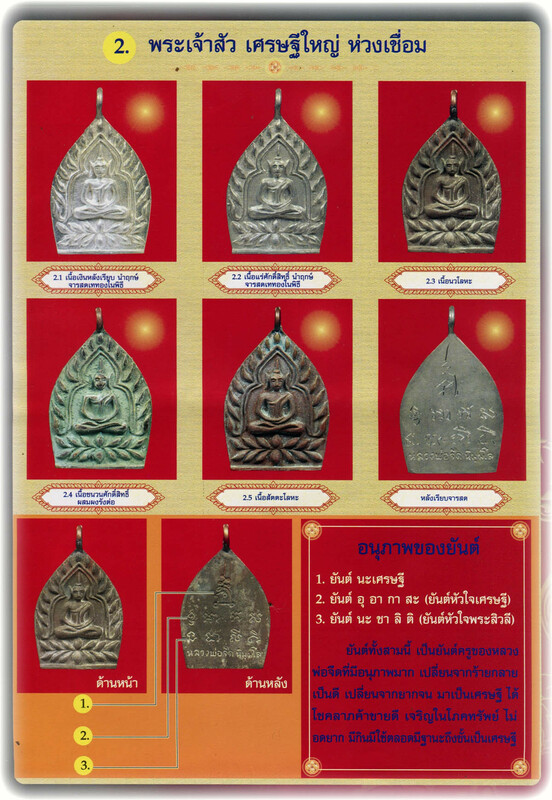 Above; Pra Somdej Gai Ser – Wat Arun 2554 BE – Classic Thai Buddhist Amulets from the Temple of the Dawn. The Somdej Gai Ser was issued in small, large and jumbo sizes. 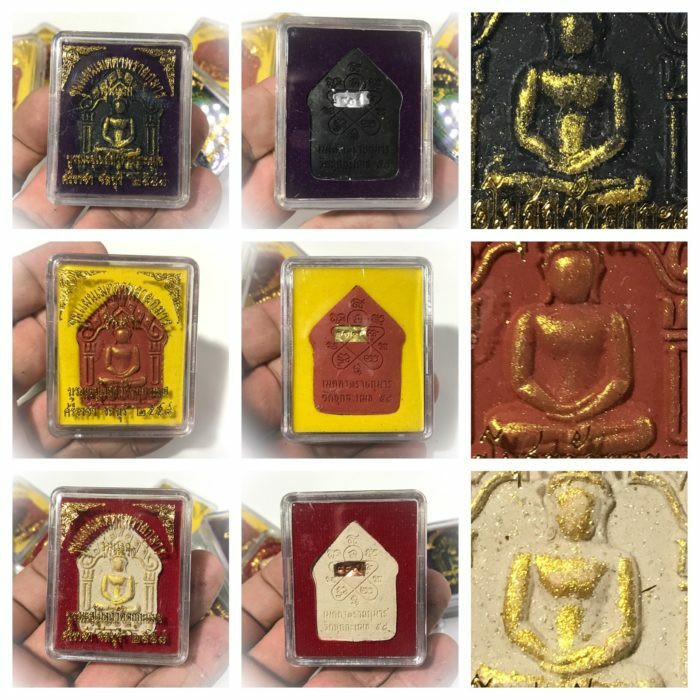 In addition to these, there were also a series of 3 amulet box sets of Pra Nang Paya Sacred Powder Benjapakee amulets released, using powders from the Ancient Kru hiding chamber of the Pra Nang Paya Gru Gao in red, white, and black Sacred powders. 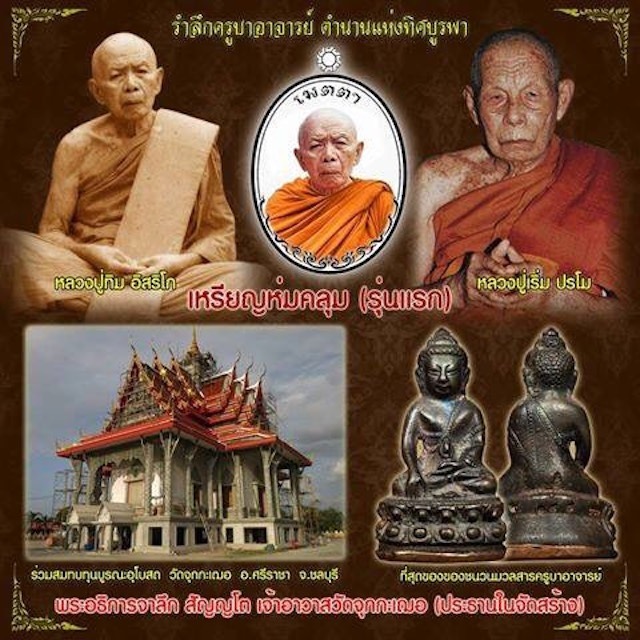 The month of April Thailand Amulets store has also been graced by a most Classic, Impressive, and Ultra Sacred 2556 Historic Edition of Classic Benjapakee Amulet from Wat Nang Paya Temple – 2013’s addition to the History Books, in the Dtamra Pra Nang Paya, and the History of the Benjapakee Family of Thai Sacred Amulets. 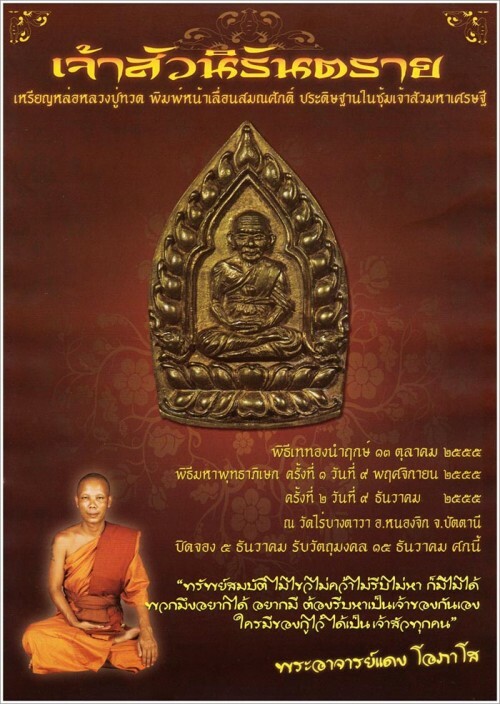 In Koo Saep Som Montr Kamakun Maha Sanaeh – Love, Commerce and Mercy Charm for Ladies and Gay People – Luang Por Wichai Passaro – Free with Casing for any purchase over $120. Apart from a long list of the vast array of Buddhist Laymaster, and Khmer Sorcery Charms for which you already know us for, but also has various new editions of Classic Thai Buddhist Amulets of high interest for collectors, and great Sacred value as Votive Images. 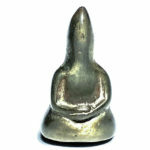 We have now increased our stock of Classic Buddhist Amulets to match our now Immense Quantity of Occult Sorcery Charms. 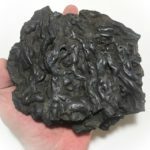 We have added and are about to add so many new amulets, making the store a Veritable treasure trove of the finest Buddhist Amulets & Occult Charms, which we believe is larger than any other online amulet store on the internet. This trend is not about to stop, rather, Thailand Amulets will continue to grow its wide ranging selection, and also keep its policy of trying to maintain as many items available in stock as we can, until the day that no more of each particular edition can be found. 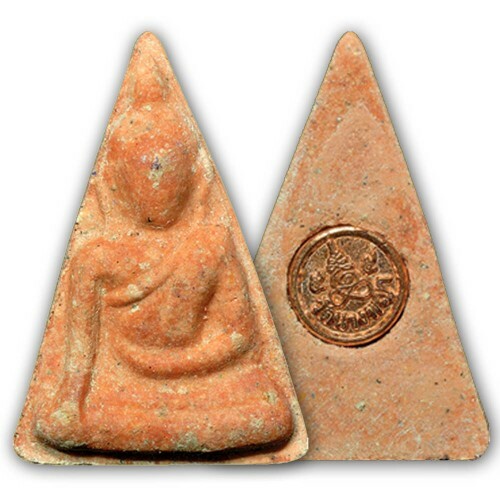 For those who are new subscribers to the amulet blog newsletter, may we remind you that we have a new store with different stock and different Masters on https://buddhistamulet.net, and our classic amulet store which is slowly growing and beginning its life as an online store at www.ancientamulet.com. Please visit to browse our other new growing stores. We hope you enjoy and appreciate reading up on the latest additions. Thank you all for your support and readership. Thailand Amulets wishes to inform you of our latest Thai Buddhist Amulets and Magic Occult Charms added to store, and to give you a preview of what is currently being added, and on the way to our store, so you can prepare yourselves for the Thai Amulets we are about to add, and enjoy reading the documentations about the amulets that are arriving. Speaking about documentation of editions, this is now something we are working a lot harder on to document and publish info about the various editions of amulets we stock. Thailand Amulets now has a new(ish) category to browse called ‘Complete Editions’, which arranges amulets by Edition and Maker instead of just Maker. We try to include documentation of the editions as faithfully as we can, including the blessing ceremony info and pictures if and whenever possible. Many new editions can be studied in this category which is in the process of growing and growing as we speak – we recommend browsing this new category and to use it for study. This edition includes super traditional Lanna amulets made in the old-skool fashion, with Yant Hneeb Takruts, Horse Hide Takruts, Pra Rahu, and some very powerful powder amulets with double Metta Wicha of the mouse drinking milk from a cat’s teat and a tiger drinking milk from a buffalos teat, either side of the amulets. This is called ‘Wicha Noo Kin Nom Maew’ (mouse drinks cats milk) and ‘Wicha Suea Kin Nom Wua’ (tiger drinks cows milk’. Metta and Amisty are the goals of the amulet of course, and Pokasap wealth and good living standards. 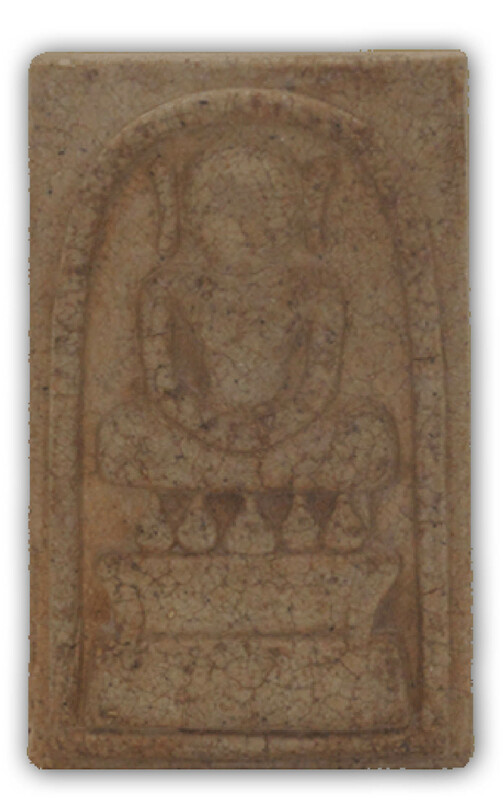 2554 BE ‘Nia Kajia Maha Sanaeh’ Edition of Thai Buddhist Amulets, from Luang Phu In of Wat Nong Meg Temple. This edition is an absolute Masterpiece Edition of Thai Maha Sanaeh Charm Amulets, using the Powerful Aromatic and precious ingredients that we have come to expect and be used to from Luang Phu In. the beauty of the amulets in this series are absolutely flabberghasting. 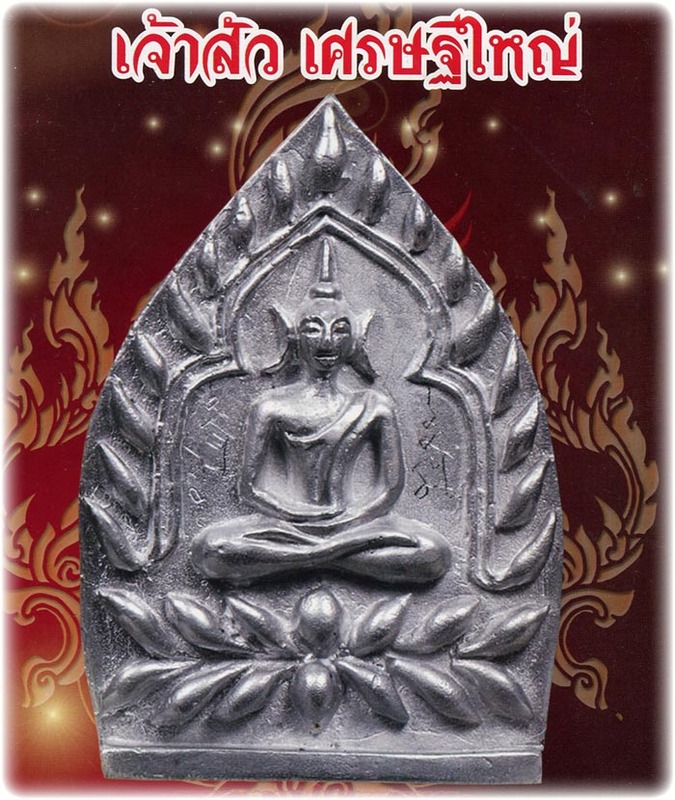 Once again the Luang Phu Bun/Perm/Juea/Kong 4 Generation Magical Lineage of Wat Klang Bang Gaew has released its latest edition of Bia Gae, jao Sua, Takrut, and Pra Laks Hnaa Tong amulets in their ‘Wicha Maha Jinda Manee Montr’ edition. 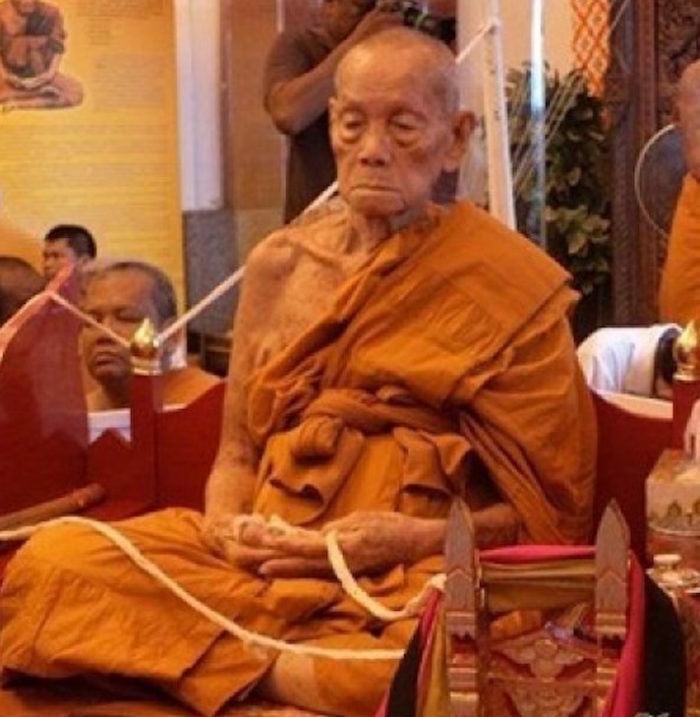 Luang Por Kong is the fourth Master in the Wat Klang Bang Gaew Lineage, and is now the current Abbot and Master Adept of the Wat Klang Bang Gaew Wicha. Amazing Lucky Money crab amulets, Cockerel of Wealth statuettes, and other charms from Luang Phu Chao in his first edition. 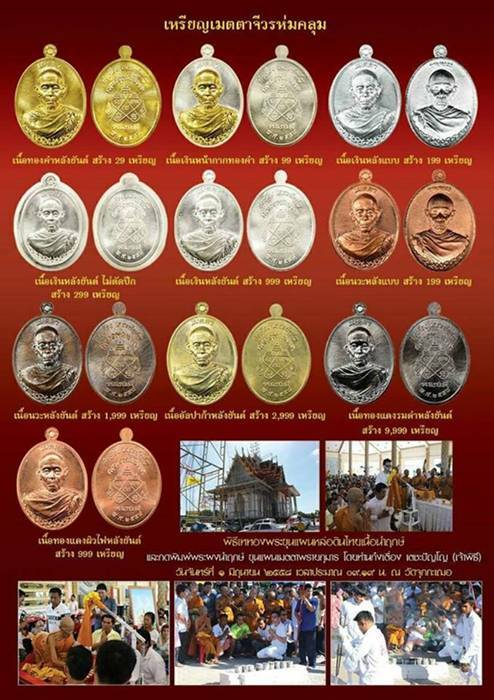 Perhaps the most Beautiful Chinarat Buddha Coins and Loi Ongk Statuettes ever to be made – Historic Edition of Classic Thai Buddhist Amulets from one of Thailands most Historic and Important Temples. This edition unfortunately is selling out as fast as we add them, and are already becoming scarce as the temple is running out of these high end (and high priced) quality coin and loi ongk amulets. Get one while you can, the first bird gets the worm. The amulets are in various mixed precious and sacred metals. A vast array of different versions and models in this first ever edition of Por Tan Kloi’s famous Hun Payont Ghost Soldier that has been produced as a Coin Medallion instead of a Loi Ongk statuette. This is therefore also a first in the History of PT Kloi’s amulets. Phu ya Tan Khien – a very disattached and humble Monk who lived in a rickety hole in a cemetery for over one year, whose amulets are becoming very popular now. His Rabbit skin lucky charm Takrut Amulet is extremely popular with gamblers. This edition of Amulets includes other items too; Look Om sacred powder balls in two different versions, some enchantment powder in phials, and some excellently made Bia Gae shell amulets. 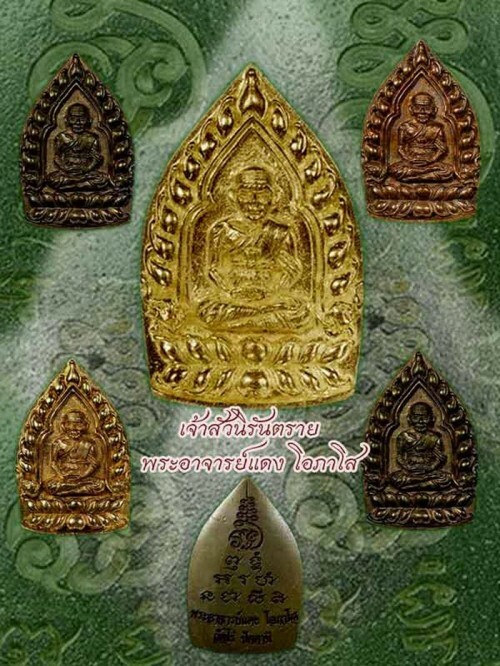 A most Classic and Collectible edition of Thai Buddhist Amulets in the Old School way, with the Images of Por Tan Klai and Luang Phu Tuad takingthe forefront of the series, and some very attractive Takrut in Sacred Metal Casings. Look Krok Plai Dam – Luang Por Mian, Pha Yant Pra Narai Yantra Cloth by Luang Por Wichai (Wat Utumporn), the amazing ‘See Pheung Nam Man Hoeng Prai Balm Potion (in Masterpiece and Normal models), from recently disrobed and once again as Lay Master; Ajarn Surapat. 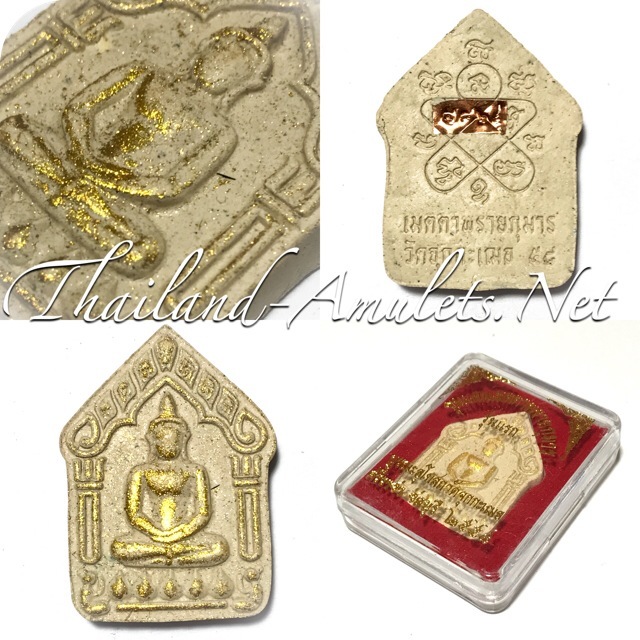 A great Many Maha Sanaeh and Siang Choke (Love and Gambling charms) have been added as is usual with Thailand Amulets (our customers like this kind of amulet), for your perusal and collections. 2 Versions of Khun Phaen sanaeh Jet Naree Pan Hlak from Luang Por Khern, Lady and Man-Tiger Lockets from LP Oe, and a series of Occult Charms from Luang Phu Naen Dam, including some excellent Khun Phaen Amulets. 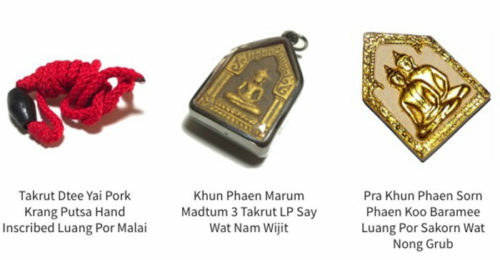 We were delighted to be able to find and restock some popular amulets from 2551, 2 and 3 BE from one of our favorite amulet makers ‘Luang Por Phad’ of wat Rai in Ang Tong. We have restocked on his famous Takrut, Garuda and Brahma amulets. His amazing and heavy duty made Takrut Fon Saen Ha and Takrut Praya Krut Pah which are so popular and successful are now back in stock The mega popular Takrut for Intelligence improvement is also once more in store, with the new additions of Pra Sethee Navagote (Nine Faced Buddha) as Loi Ongk Statuettes, and some most Beautiful Loi Ongk statuettes of the Lord Buddha for Meditators ‘Somdej Ongk Patom’ in sacred metals with gemstone and sacre dpowders in base. 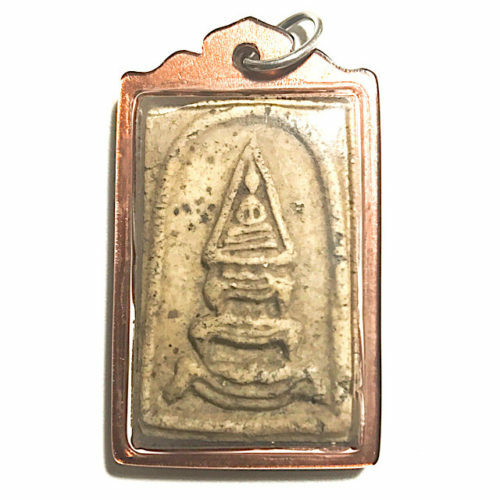 We recommend this amulet to Meditators and Puritan Buddhists. Many 9 Tails Fox Lockets and Powder amulets from various Masters have been released this year, most of which we have tried to stock for you. Till now we have 9 Tails Fox available as lockets and sacred powder amulets from LP In, LP Oe, LP Khern, Ajarn Khwan Chai Intrapaet, Ajarn Por Phu Noi Dtan, and from Kroo Ba Krissana’s Close Associate; Kroo Ba Beng. 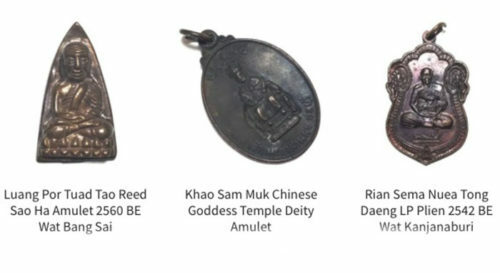 There are simply too many new Thai Buddhist Amulets and Occult Charms added to list here, so why dont you simply browse through the All Amulets Category and see the latest amulets added to the store.. we still have over 200 types of new amulet to add, and 3 new complete editions on the way, including the soon to arrive LP Jerd/Sivali Lockets with 56 and 108 Takrut Inserts. Also soon, we can expect a new edition of Jao Sua Luang Por Tuad coins in traditional design from Pra Ajarn Daeng Opaso coming up next month in December. Thats about it for now, as we have to get back to adding more Thai Amulets to the store, they are arriving faster than we can add them! We hope you enjoy reading the write-ups of the new editions and amulets, and that they are in line with what you seek. Please comment with your feedback, interests and wishes using the comment form. 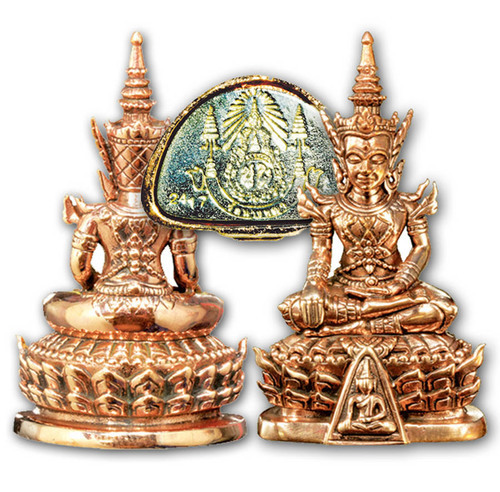 Thailand-Amulets – Sacred Thai Amulets for Wealth, Health, Protection, Love and Happiness. 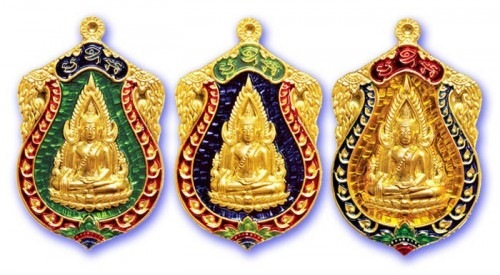 We have now moved our official store to the new domain of thaibuddhistamulet.com, but thailand-amulets.net remains as the informational website and store that it always was, and will grow in info pages, as well as use the blog section for Newsletters (subscribe by email to recieve them). As to thaibuddhistamulet.com, this will remain a simple store with blog section that is a secondary way of browsing the store by using post categories, which, although similar to the store categories, display blog posts and articles instead of products in the store. We hope you forgive us for the double-act of using two different domains that contain the same storefront, but the new domain name is something which which benefits us greatly as far as search engines are concerned, for this reason, please forgive us for changing the default domain in the account and invoices, but your account is equally valid on both websites, and is not separate in any way. 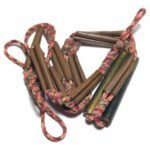 Everything continues as normal with Thailand-Amulets.Net and you won’t notice anything different continuing using this store. Its just that both stores are controlled by one administration panel which allows for a very easy control and oversight of our customers and orders. 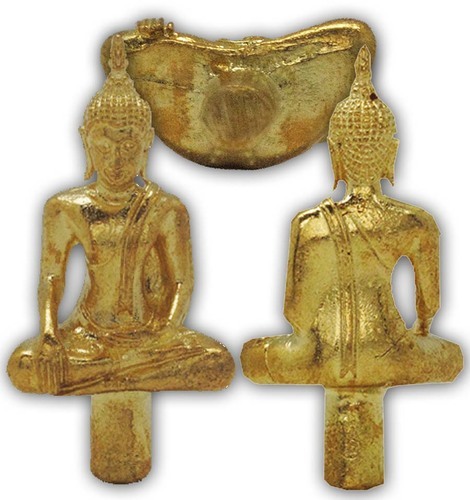 You can surf the Amulets in store more quickly on thaibuddhistamulet.com, but if it is info you wish to research, then thailand-amulets.net remains the Reference Standard info website for Thai Buddhist Amulet. 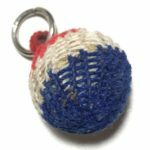 2 Thailand Based Buddhist Amulet Websites with Different Blog Content, Same Store, same login, and lots of Thai Buddhist Amulets. 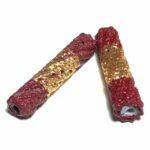 Thai Buddhist Amulets last Month has seen a host of fascinating high class items to the store, and we havce seen a massive rise in the quantity and quality of our choice of amulets and Bucha Items. The latest additions already added, as well as those we have recievged already but have not yet had time to write up and add to the store will be presented in an Article on the new HQ thaibuddhistamulet.com – Newsletters such as this one will remain coming from thailand-amulets.net, and all info pages will also be added only here. thaibuddhistamulet.com will not contain pages, only blog posts and articles. Both sites are equally interesting to surf and read, so please enjoy both of them, and dont worry about your shopping cart if you are on both sites, because it is the same shopping cart, and does not need two separate accounts to operate through either store.The new domain will contain some amulets which thailand-amulets.net does not contain, which are special individual auctions made through separate individuals. 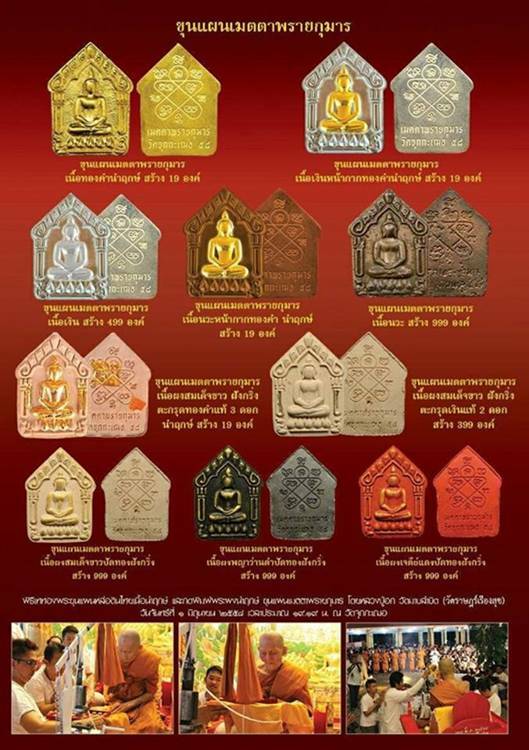 Some of these will be extra special chances to obtain rare amulets, and will appear in the ‘Auction’ Category (in construction) on thaibuddhistamulet.com, so watch out for auctions too. If you planned to spend more than 200$ on amulets this month with us, you are in Luck – simply enter this coupon code with any purchase of one or more amulets or other items, whose sum total exceed 200$ when you reach the checkout page, and you will get 12% of the total price reduced, as well as the usual free registered airmail delivery offered by Thailand Amulets store. Valid for single use one time per customer.